It has been a year of extremes on the weather spectrum in B.C., and the effects of floods, fires and lengthy fall rains are being felt by farmers and local animal rescue groups. According to Belinda Lyall, founder of the B.C. Horse Angels, a horse rescue organization in Salmon Arm, a shortage of hay has further complicated the task of feeding and caring for the large number of horses she has rescued and seeks homes for. This sentiment is echoed by Shirley Mainprize, who operates the Turtle Valley Donkey Refuge near Chase. Normally, the donkeys can graze for a good portion of the year, saving some feed, but in 2018 the conditions were not ideal for grazing. This put the donkey refuge in a tough position, unable to put the animals out to pasture and forced into seeking extra hay from an already-limited supply. “We started looking for hay early and we wrapped it up; when we found it we pre-paid for it. We have over 100 animals in our care, we can’t gamble,” she says. According to Bill Armstrong, a farmer in the Salmon Arm area who supplies hay to smaller local operations, it wasn’t necessarily a bad growing season that dwindled local hay production, but the weather was terrible for drying the harvested crops. Hay that is not properly dried can still be stored away and made into silage, but Armstrong says this is not a viable solution for most people. Silage can only be kept for a few days at most once removed from the pit or packaging, making it hard to use for anyone without a large, dedicate storage area. He also notes there is waste in terms of packaging and spoiled feed that comes with using silage, making it unappealing for some. In addition to the smoke and dryness of the summer, fall of 2018 was an extremely wet one in the Shuswap, Lyall says, meaning late planting and fall harvests were lower than usual. “The farmers I talk to have all been saying this is the wettest fall they remember since the 1960s,” she says. In order to ensure she can feed her animals, Lyall needs to jump at the first available feed – regardless of price. Mainprize says that having a good stock of extra feed is important, but she admits it is not always a cut-and-dried task. Both of these animal rescues are undertaking their own forms of fundraising to help mitigate the effects of a feed shortage on their operations. Lyall has been attempting to fundraise as a way to subsidize the now-increasing cost of hay to feed the rescued horses, starting a GoFundMe campaign that has been shared around social media. 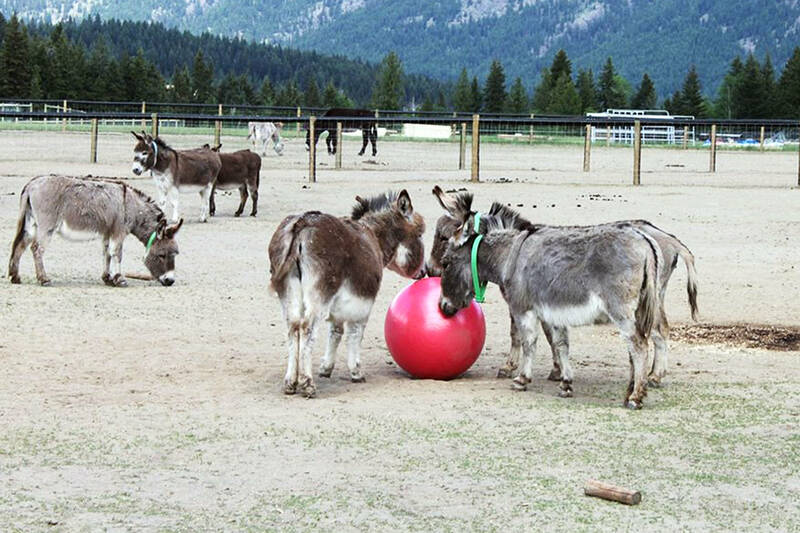 Mainprize and the Turtle Valley Donkey Refuge, on the other hand, have received some assistance through a BC Gaming grant to build a new well on the property so their pastures can be better irrigated. The refuge needs to come up with half the money for the project, around $50,000, with plans for a series of fundraising initiatives in 2019. “We are just doing the final touches and kicking off our program hopefully by April 1, starting with a cookbook. We are sending it out to our donors looking for tried, true, go-to recipes. We always do a raffle every year and will be doing that as well, and there will probably be a couple of events at the farm as fundraisers,” Mainprize says.